DWDM is the technology of choice for transporting extremely large amounts of data traffic over metro or long distances in telecom networks. Optical networking andespecially the use of DWDM technology has proven to be the optimal way of combining cost-efficient transport with advanced functionality that can cope with the bandwidth explosion from the access network. DWDM puts data from different sources together on an optical fiber, with each signal carried at the same time on its own separate light wavelength. Using DWDM, 80 (or more) separate wavelengths or channels of data can be multiplexed into a light stream transmitted on a single optical fiber. Since each channel is demultiplexed at the end of the transmission back into the original source, different data formats being transmitted at different data rates can be transmitted together. Specifically, internet (IP), SONET and Ethernet data can all be traveling at the same time within the optical fiber. A super-channel is an evolution in DWDM in which several optical carriers are combined to create a composite line – side signal of the desired capacity, and which is provisioned in one operational cycle. This multi-carrier approach to building a DWDM network delivers scalability to terabits and beyond. The simplest way to create a wavelength division multiplexing (WDM) network is using an embedded xWDM solution. In an embedded solution, a CWDM or DWDM transceiver is connected directly into a SAN or IP switch. Each signal that comes from the different transceivers is then connected to a multiplexer, which gathers them together and transports them over a single optical fiber link. 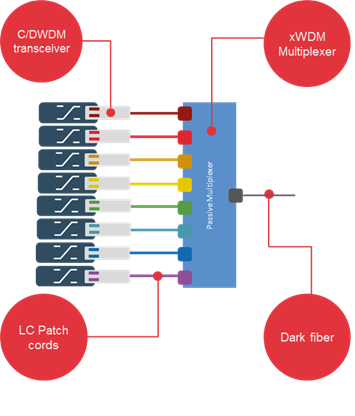 The recipe for data connectivity using a WDM system requires four main ingredients: dark fiber, an optical transceiver, a multiplexer, and a patch cord connecting the transceiver and the multiplexer. With only these components, an embedded WDM solution is as simple as connecting a single channel transceiver to a data switch to connect it to another switch via a line fiber. And it’s as easy to implement and manage. 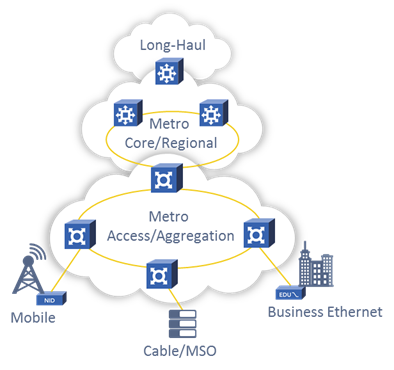 When there is no fiber plant in the ground, it often takes a Service Provider significant time to provision fiber in order to deliver a Carrier Ethernet service – in some instances this can take months. In the meantime, the Enterprise customer will have to make do with whatever connectivity is available – often this may be an xDSL service. The Service Provider can use a Liberator 305-LTE to deliver Carrier Ethernet services using the in-built 4G/LTE radio. The Liberator 305-LTE establishes an L2TPv3 tunnel over the 4G radio. Integrate and enhance your IT infrastructure to be the most efficient and productive at the lowest total cost.